In this moment, Antetokounmpo is a threat to block Jimmy Butler's shot and deflect any pass to Ben Simmons in the corner -- or at least apparate there to harass Simmons on the catch. He is effectively in two places at once. Simmons cuts baseline, and Antetokounmpo casually bats the pass out of the air. He barely has to jump. A few speedy, giant centers -- including Joel Embiid and Rudy Gobert -- cover this much space. Draymond Green is a genius who moves almost ahead of the ball, but he can't match Antetokounmpo's speed, leaping ability or length. Ditto for Paul George. Antetokounmpo is the only one among them who can credibly guard every player in the NBA. He is (again) averaging almost 1.5 steals and 1.5 blocks per game -- rare territory. Opponents are shooting 53 percent at the rim with Antetokounmpo nearby, one of the lowest marks in the league, per NBA.com. They have scored a laughable 0.68 points per possession when they isolate against him -- the eighth-stingiest figure among 177 guys who have faced at least 100 one-on-one attacks, per Second Spectrum. No one bothers trying to post him up; he defends one such play per 100 possessions, via Second Spectrum. He smothers both sides of a pick-and-roll. Antetokounmpo may end the season as favorite for both MVP and Defensive Player of the Year. Yikes. As Brett Brown microwaves this strange, promising chemistry experiment, he has lately tried attaching Simmons to the sacrosanct Embiid/J.J. Redick minutes. That is a massive change; for two years, the Sixers have mostly staggered Embiid and Simmons. They didn't have Butler and Tobias Harris for most of that time. Brown feels comfortable having those two run the show when the Simmons/Embiid/Redick crew rests. That doubles as a method of getting Butler his touches. That all makes sense, and Brown may not hold fast to any rotation. One consequence worth monitoring: This pattern has T.J. McConnell, Simmons and Embiid playing together more, and that makes for a crowded lane when Embiid holds office hours. Philly has typically struggled when McConnell and Simmons play together. (Of course, the Sixers perked up against Boston in last season's playoffs when they started McConnell. Matchups and small samples rule the day in April and May. Simmons and Redick are also developing their own funky two-man game.) When things get gummy, Brown pulls McConnell in favor of Mike Scott or James Ennis III. He didn't play the McConnell/Simmons/Embiid trio at all in Philly's streak-buster over Boston on Wednesday, perhaps signaling that experiment-within-an-experiment has been scrapped. Nothing is set in stone. Every key player must sacrifice for this to work. In big games -- including in landmark wins this week over Milwaukee and Boston -- Philly has done well sorting it out on the fly, even if it means Harris goes too long without touching the ball or Embiid spends too much time for his liking in the corner. Butler is a smart, physical cutter. He draws fouls on cuts before getting the ball, which is rare. He could stumble into 12 random points like this every game, which is part of why his occasional insistence on commandeering more of the offense -- quieter lately -- can frustrate. Sexton is kinda starting to happen. His 3-point shooting -- up to 42 percent -- has been a slow-burn shocker. It began with Sexton canning open 3-pointers when defenders ignored him, or ducked 10 feet below screens. He had time to check the wind. Skeptics shrugged. He kept hitting those, even as defenders at least waved at him. Now, he's dribbling into 3s when defenders chase him over screens. He's even daring the occasional step-back, and he buried both Detroit and Milwaukee this week with daggers. That is a barely 6-foot guy finishing through Andre Drummond. Playing with Kevin Love again has helped; the Cavs have outscored opponents by 2.6 points per 100 possessions when Love and Sexton play together, per NBA.com. Sexton remains a train wreck on defense. His score-first approach has annoyed teammates. He still isn't creating enough for others, leaving the Cavs a little puzzled over what sort of perimeter players they need alongside him long term. But this change-of-pace guile is promising precisely because it is Sexton prodding far enough to create passing lanes instead of settling for 20-foot bricks that create none. The next steps are anticipating those passing lanes, and exploiting them. Beyond that, there is just something to like about Sexton. He is fearless, and the best kind of cocky. I sat courtside in Philly last Friday as an undermanned Cleveland team battled the Sixers to the final buzzer. Philly was visibly disinterested. That annoyed and emboldened the Cavs, especially Sexton. They wanted to punish the Sixers for their arrogance. That is almost the reverse of a Kobe Assist -- a basket most point guards would not think to hunt. Sexton has the sort of spirit a team can rally around, provided he improves his passing. Sexton is a long way from being even average for his position. But his first-year trajectory has been encouraging. Collins is shooting 74 percent in the restricted area, and it sometimes looks as if he's flinging stuff up blind from awkward angles. He's great fun to watch. Young and Collins already have a nice chemistry, and it should deepen as Collins grows more comfortable pick-and-popping for 3s; he's shooting 36 percent from deep, and only about one-third of his attempts have come from the corners -- a crazy transformation from last season, when he launched almost exclusively from there. Both Young's and Collins' shooting percentages crater when each plays without the other. Collins can get a little thirsty for points. As he improves his passing, he is going to be an absolute stud on offense. The other end will determine his ceiling. The misfit post-trade-deadline Wiz have been a blast, but going forward, they have to establish a defensive identity. That typically starts along the front line, and their current group does not appear equipped for it. The Wizards rank 26th in points allowed per possession, and they have been atrocious all season. They face a ton of questions, and those surrounding their high-wattage guards draw the most scrutiny -- starting with the possibility of Bradley Beal's supermax eligibility this summer. But they have zero long-term certainty at either big man spot, and good team defense fans out from there. In July 2017, this dude showed up in Salt Lake City as an unsigned practice player with Utah's summer league team, got his tooth knocked out during a scrimmage, went to the hospital, and came back that night for another practice. That's how desperate O'Neale was for an NBA job. If you are going to make it as a low-usage wing, you have to attack scrambled defenses off the catch without hesitation -- and have the smarts to make the next play in traffic, moving at full speed. O'Neale sees Luol Deng leaning away from him to bother Joe Ingles, and knows he has an alley that will close fast. He does not pause. He does the opposite of pausing. He is already running toward the rim before Ingles' pass hits his hands, to the point that he risks leaving the ball behind. O'Neale is so decisive, and shifts into top gear so fast, it's almost alarming. You worry he's going to crash into the basket stanchion, or just lose control of his body and fall over. That is a monster pass. Washington clogs the two easiest options -- the drop-off to Rudy Gobert, and the kick to Jae Crowder in the corner -- so O'Neale, under the rim and in midair, mind you, throws a fastball to Donovan Mitchell. O'Neale knows he's not going to play 30 minutes or take a bunch of shots, so he goes all-out on defense. He's feisty, and often guards the best opposing scorer. He's really strong. Oh, he's also shooting 40 percent from deep. I'm even optimistic Booker can make himself into an average-ish defender. He has solid footwork and timing; when he tries hard, he holds his own. But when he relaxes, it gets ugly. You see this pattern too often: Booker is late getting into a stance, and compounds that by taking a bad route around Jahlil Okafor's screen. Booker doesn't have the wingspan to get away with late contests against good shooters. Other high-volume ball handlers -- Westbrook and John Wall come to mind -- sort of vanish into the ether like this, too. No one carrying Booker's load on offense is going to exert peak energy on every defensive possession. But as the Suns build their roster, Booker will have to do better. That is not easy. Smart's swipe at Khris Middleton should give Malcolm Brogdon a driving lane when Middleton slips him the ball. Brogdon thinks he has one. (Brogdon is an elite catch-and-go driver. It might be his best skill, and the one Milwaukee will have the hardest time replicating in his absence.) But Smart shifts back to Brogdon in concert with Middleton's pass, cuts him off along that tricky diagonal, and takes the ball. What even is this closeout? Boston is known around the league for teaching innovative closeout tactics, but I'm not sure this is one of them. I couldn't tell watching live what direction Smart's body was moving as he approached Vince Carter. Was he about to collide with Carter? Wait, was he actually sliding into the passing lane between Carter and Trae Young? Imagine trying to suss that out on the floor, with Smart sneering and flying right at you. He looks like he's somehow moving in three directions at once. It's enough to freak Carter into hesitating before bricking this corner 3. 9. Zach LaVine, showing glimpses? I am still not buying LaVine as a Most Improved Player candidate, or future alpha dog of an NBA contender. He is not James Harden -- wing operating as point guard -- no matter how much the Bulls push it. He turns the ball over too much, jacks at least three horrible shots per game, and gives back so much of his offensive production with clueless defense. But LaVine doesn't have to be Harden. He just has to be better, and he has shown glimpses. He opened the season rampaging to the rim, and that has sustained. He's well above the league average from deep on a diet of contested, off-the-dribble attempts. LaVine has leveled up on that slingshot to the weakside corner. He whips it off the bounce, with a one-handed gather that works to disguise the pass until it is airborne. He releases it with the key help defender -- Josh Jackson -- still leaning into the paint, away from Lauri Markkanen. LaVine's passing numbers are at career-high levels. February may have been his best passing month ever: 58 dimes against 24 turnovers. 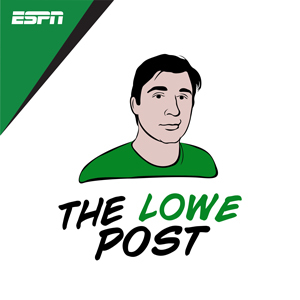 ESPN's Zach Lowe talks to various basketball people about various basketball things. Listen now! He still has a long way to go. He's dishing 4.7 dimes per game -- not exactly John Stockton territory. His assist-to-turnover ratio is about even again in March. He gets caught in crowds, threads passes that aren't there, and kicks to shooters who have already cut someplace else. But all progress is healthy, and LaVine has shown meaningful progress. That's a gamble. Four colors -- blue, red, black and white -- can be noisy, but the blue is serene and the black grounds everything. The Bulls and Sixers (with their Rocky-themed uniforms) unveiled two of the only jerseys in NBA history featuring no lettering at all on the front. That works here, too; the four stars -- taken from Chicago's city flag -- are a familiar local referent. My favorite part: the blue-on-black lettering of each player's name on the back. Gorgeous. Blue on black is a consistent winner; it has always been so for the Orlando Magic. I also like that the Bulls kept the lettering plain, without shadowing or any border. It's a clean look.